Render this image in Arabic (ar)Danish (da)German (de)Spanish (es)Estonian (et)French (fr)Italian (it)Japanese (ja)Dutch (nl)Norwegian (no)Portuguese (pt)Romanian (ro)Russian (ru)Swedish (sv)Urdu (ur)Chinese (zh)(default language) . To embed this file in your language (if available) use the lang parameter with the appropriate language code, e.g. 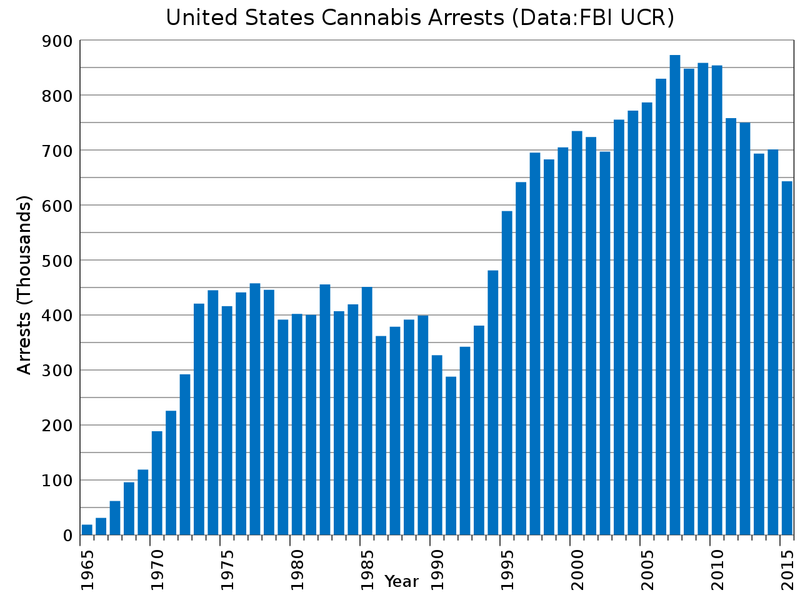 [[File:US Cannabis Arrests.svg|lang=en]] for the English version. To translate this file into your language, download the file to your computer, add your translation and re-upload it with the same name. You will find help in Graphics Lab if you’re not sure how to do this. English: Arrests for cannabis in the United States each year from 1965 to 2015, from the FBI Uniform Crime Reports. Date 30 August 2014 – date of original file here on the Commons. 1965-1993: Marijuana Research: Uniform Crime Reports – Marijuana Arrest Statistics. Source: FBI Uniform Crime Reports. 1982-2007: Drugs and Crime Facts: Drug law violations and enforcement. From the United States Bureau of Justice Statistics (BJS). Source: FBI Uniform Crime Reports. Click on the charts to view the data. Total Number of Arrests in the US by Year and Type of Offense. Table has possession and sales breakdown, total drug arrests, violent crime arrests, property crime arrests, and total arrests of all kinds. Since the 1980 number is different between the sources, the Drug War Facts number is used due to the detailed listing of sources. United States Crime Rates 1960 to last year. Translations are included for Arabic, Chinese, Danish, Dutch, English, Estonian, French, German, Italian, Japanese, Norwegian, Portuguese, Romanian, Russian, Spanish, Swedish, and Urdu. Other languages can easily be added.